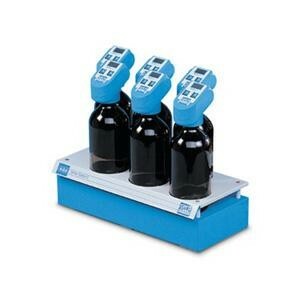 BOD Sensor Systems 6 consist of 6 position stirring unit complete with 6 BOD Sensors, 6 alkali holders for absorbing the carbon dioxide and 6 stirring bars. The instrument represents a complete solution for the user. It is immediately operational for measuring the BOD on 4 scales - 90, 250, 600 and 999 ppm BOD - higher values can also be measured by diluting the sample. The sample quantity to be examined varies from 100 to 400 ml, and the bottle’s total capacity is 500 ml. The compact, easy-to-handle design means that 6 BOD bottles can be housed in a small amount of space. The instrument features a stirring system offering non-stop operation without risks of shut-off or overheating.